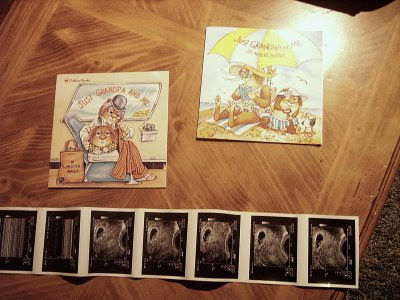 Matt and I wanted to tell our parents in a creative way that we were having a baby! Since we don't live by any of them we wanted it to be fun. What was really exciting though was that we got to tell some of them in person. My Mom and Tom came to visit us on Matt's Fall Break and we had this sitting on the table when they walked in the house for the first time. It took my mom a minute to catch on (go figure) but she eventually did. They were shocked. Then we drove to Tennessee to spend Thanksgiving with Matt's family and this is how we surprised them. We gave them each something and had them open it. 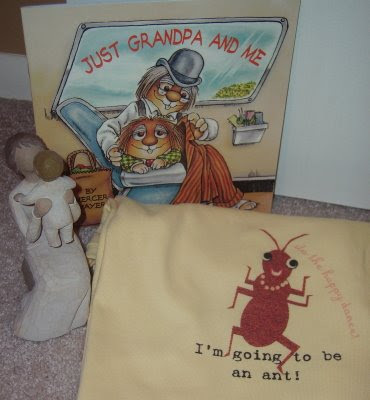 Matt's mom got the Grandmother Willowtree (that is the figure), Stacy got the Aunt T-shirt and Frank got the book. They loved it. Sadly we were unable to tell my Dad in person so we mailed him a book and an ultra sound picture and then called him on Thanksgiving! He was very excited about the news!!! We were so fortunate to share this special time with our family and friends in St. Louis. We have passed the word on to our other family and friends by phone, emails or the blog! Thanks for sharing in our joy of Baby Loveall! Congrats Matt and Emily! I am SOOOOOO excited for you!